As good as the first film, this one has a story about Rocky trying to give up boxing in search of something else, and all of the conflict that comes along with that. Rocky II is just about as good as the first movie. that’s because while the conflict between Rocky and Mickey is gone, there are plenty of other new conflicts to take it’s place. There’s the issue about how Rocky can’t get a job anywhere and when he does get one, he can’t seem to keep it. There’s also the angry opponent from the first movie, Apollo Creed, who demands a rematch and is ready to intimidate Rocky until he agrees. This is the single movie of the series that features the best training sequence with a montage followed by a sequence of Rocky running past the Italian market and through the streets of Philadelphia. even the fight at the end of the movie is better here than it was in the first film. the first movie definitely had stronger conflict and got into the character’s life, but this second film makes up for it in plenty of other ways. Rocky II is a very good sequel. In fact, it’s probably about as good as the first movie. That’s a high mark to beat, because the first film had all the conflict between Rocky and his manager, Mickey, going for it. In that movie the two of them started out as enemies and ended up as friends. In this movie, the changing relationship is between rocky and Apollo Creed. 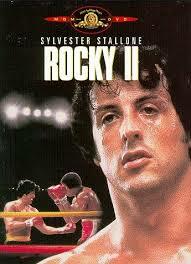 Apollo was Rocky’s opponent at the end of the first film, and he is again rock’s opponent in this movie too. Rocky II opens with showing us clips of the fight that ended the last movie. We start on a black screen with the sounds of the last fight being played for us, before the picture comes up and throws us right into the middle of the fight. The clips become more like full scenes and we end up watching what feels like the second half of the fight. That’s a pretty cool way to start, getting us right back into the excitement while also reminding us of what happened. This movie continues from where that film left off, showing us the aftermath of the fight as the characters are leaving the arena. I love movies that do that, picking up exactly where the last film left off, continuing from the exact same scene. Whether it’s the karate kid II, Halloween II, or Quantum of Solace following bond from where he ended up in golden eye, it’s a great move and it always works. Here, in Rocky II, the ongoing story brings us into the hospital as both boxers are brought in, rolled inside in wheel chairs. Apollo is shouting at Rocky about wanting a rematch and Rocky is calling him out on it, asking him why he said, while in the ring, “there isn’t going to be a rematch.” I love that Rocky asks Apollo this, since we all heard what Apollo said in the ring. For the audience, if not for rocky doing this, we might have thought we were hearing things before or not understanding Apollo correctly. It’s during the hospital stay that Apollo comes to appreciate rocky for the first time. There’s one moment where rocky goes into Apollo’s room at night, opening the door just a crack while the champion remains in bed, and asking Apollo for the truth. Rocky wants to know if Apollo gave it all he had, or if he held anything back. Apollo tells him that he gave it his all. The movie then continues with the story to show us rocky leaving the hospital after his stay there, walking out with Adriane, and proposing to her right outside of a zoo. Rocky and Adriane get married, but things are not so great in the fighter’s life other than what he has going with her. Rocky can’t find a job. He doesn’t want to box because the doctors say if he gets hit in the eyes too much more, it might permanently damage his vision. Rocky also doesn’t want to work for the loan shark, gaze, anymore, like he was doing in the first movie. That job of hurting people just isn’t for him. So Rocky tries to find a job in other places and is constantly turned down. At one point he even attempts to do a commercial and has trouble reading the lines. Rocky gets frustrated and storms off the set. Rocky does get a job working at the meat factory, which his friend, Paulie, is able to get for him, but that job is only temporary. It isn’t long before they have to let Rocky go in order to keep people who have been there longer than him. While all this is going on, we start watching Apollo sitting at home with his manager, receiving letters from fans who are angry. They can’t believe their beloved champion almost let rocky win. This gets Apollo angry and ready to bring rocky out of retirement for that rematch. Apollo’s plan starts with a chicken cartoon that gets published in the newspaper and has rocky drawn as a chicken. After that, Apollo goes on TV and tries to goad rocky on, saying the guy are a coward who won’t come out to fight. By the end of the news interview, Rocky has made his decision. Despite his wife’s protest, rocky is going fight. He gets Mickey back and is all ready to start preparing; only it’s at this same time that Adriane is about to give birth to their son. Adriane does give birth and then immediately goes into a coma. 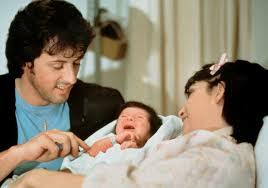 When she wakes up, she has a couple of words for Rocky that begin the greatest training sequences of the Rocky series. Adriane pulls him close to her mouth and whispers to him, “win.” that’s when Mickey chimes in loudly, “what are we waiting for?” and it all gets started. Two different training montages starting with the church bells and Rocky doing pushups. The first sequence is the montage, the second one is rock’s run through the streets of Philadelphia, and they are both played to that fantastic Rocky Balboa music. This all brings us to the fight at the end. Adriane can’t be there, at the match because the doctors say she still needs to stay home and recover. But rocky goes at it with Apollo and it’s a much better fight than in the first film. For one thing, this one involves strategy that we are made aware of. Rocky is a southpaw, meaning he is left handed, but for the first half of the fight, he hits with his right hand. He’s saving the best for after Apollo gets tired. There are a lot of reasons why Rocky II is pretty much as good as the first film. One of them is Rocky’s conflict with finding a job. Another one is the combination of two perfectly executed training sequences toward the end of the film still another reason is that the fight in this second movie is much better than the fight in the first film, and even involves some strategy. I like that Rocky II doesn’t repeat any of the same ideas as the first movie and instead feels like it’s own film. It’s another winner for the series.